Turns out he has a girlfriend back in his hometown somewhere in Long Island. I guess the schools aren't as welcoming to the undead there or something. Colette, who is Watson to my Sherlock, Robin to my Batman, Kato to my Clouseau (although her kung fu is weak!) overheard him bragging to his friends about his "wicked hot trad girlfriend" back on "the Island". She couldn't get close enough to see, but apparently he backed up his claims with some Facebook-ish type evidence. "Yeah, right," says I. "The old 'girlfriend back at home' ploy. I ain't buyin' that snake oil, sistah!" Sometimes, when I have a mystery to solve, I find that it helps to wear a fedora and talk tough like a 1940's L.A. gumshoe. I didn't have a fedora, though, just this really cute black with pink polka dots headband. Colette just looked at me like I was crazy. "He had messages from her," she said. "And pictures." "Right," I said. I decided that confrontation was the key. "Hey, Trav," I said when we were walking to his next class, on what was supposed to be the last day of me chaperoning him, "I need to ask you..."
"Look," he said. "Before you hit on me, you should know I have a wicked hot girlfriend on the Island." "What?" I said, and then he proceeded to tell me how he'd been seeing her for three years, they are in love, they will be together as soon as super-science finds a cure for zombiism, etc. etc. etc. "Look, Margi," he said. "Don't be sad. You are cute and all, but Bree and me...it's really love." Grr. I wasn't hitting on him, for the record. And now, to talk to Eric and find out what this kitty obsession is all about! 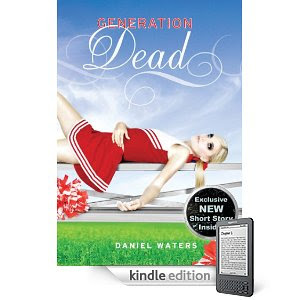 The Generation Dead Series is Finally available in electronic editions, and each title has a brand new Generation Dead Short Story! Stay tuned! Margi has an update on her mystery that she will post tomorrow! Okay, so my "Secret Admirer" wasn't Luis. How do I know? you may well ask. Well, I used all of my considerable powers of deduction, espionage, observation, and detection. And plus I asked him why he put the card with the kitties on it in my locker. The problem with differently biotic people--okay, problem is the wrong word, if Phoebe bothered to edit my entries any more she'd slap my wrist for suggesting that anything about the poor dead dears was problematical--what I meant to say was one of the many unique and endearing distinguishing characteristics of differently biotic people is that it is nearly impossible to tell when they are lying. They don't blush. Their eyes don't twitch up and to the left, they don't shake, and you can't tell if there is an additional quaver in their voice. All of which adds up to me not really being able to tell when they are lying. And they do lie. Colette Marie Beauvoir especially is always telling lies. I know you stole my pink socks, Colette! Confess! Confess! But Luis wasn't lying. I didn't need telepathetic powers to tell me that. But what if it isn't one of them, as I originally thought? What if the card is a joke, as some of you suggested, or what if it isn't from a secret admirer at all but a secret creeper? Brrrr. By the way, it isn't from Norm. Don't ask me how I know. I just do. BTW and OMZ, after I asked about the card, Luis said he "liked me". Bells rang. School bells, not wedding bells of course, so he didn't really have time to elaborate.